This watch is stunning, and I was so disappointed that the band was, too, long. I do have a very small wrist. Had to return. This watch can be worn for dress or casual so don’t hesitate to order. This August Steiner women's watch features a reliable Japanese quartz movement, and classy bracelet. 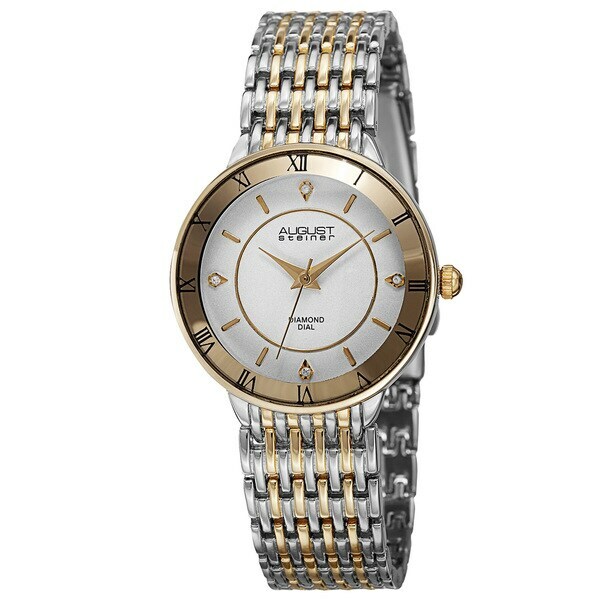 Roman numerals on the outer dial and diamond markers on inner dial give it a dainty as well as sophisticated look. This can be worn for every occasion. Beautiful watch. Nicely polished metal. The band looks like jewelry. Japanese quartz movement should last a while. Recommended. Analog dial available. "Is the bracelet adjustable? 7.5" the longest length? If adjustable, shortest length?" Yes 7.5 is the longest. Most of my jewelry is gold and silver. With this two tone I won't need two watches. It's a dress up dress down watch and it was on sale.